It has been seven years or so since Justice Clarence Thomas has said word at Supreme Court during oral arguments so when he spoke, he made the news. But he still hasn’t asked a question, so that streak is intact, and we aren’t really sure what he said. Thomas seemed to be making a lighthearted joke about lawyers trained at his alma mater, Yale Law School, or its rival, Harvard; the Ivy League is a common Thomas target. 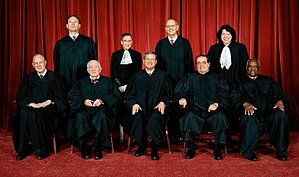 But several justices were speaking and laughing at the time, and Thomas’s exact comments apparently are lost to history. Too bad. This is what we have for a transcript. Monday’s case was from Louisiana, and the question was whether years-long delays in funding lawyers for an indigent man facing the death penalty violated his right to a speedy trial. Jonathan Boyer’s lawyer, Richard Bourke of New Orleans, said the delay meant that Boyer did not have lawyers competent to handle a complicated murder case that brought the prospect of the death penalty. Justice Antonin Scalia, however, suggested that Boyer did have qualified lawyers. Didn’t one of them go to Yale? he asked Carla S. Sigler, the Louisiana assistant district attorney in the case. She did, Sigler said. And didn’t another attend Harvard? Scalia asked. Yes, again, Sigler said. “Son of a gun,” Scalia said. Thomas was among the justices — all nine attended either Harvard or Yale — who either laughed or made side comments at that point. Sotomayor, a Yale graduate, then asked Sigler what was enough to make a lawyer constitutionally adequate. “Or even just passed the bar?” Sotomayor asked. “Or LSU law,” Sigler said, referring to Louisiana State University. Thomas famously does not believe that the Justices should be asking pesky questions during oral argument believing that it is the time that the lawyers for each side should lay out their cases. Other Justices don’t agree. None of his colleagues, conservative or liberal, share such a view. They believe that the lawyers make their case in briefs filed with the court, and that oral arguments are the chance for the justices to challenge their theories and make them respond to their opponents’ arguments. Makes me wonder if he reads any of the briefs. He doesn’t have to because Justice Scalia is around to tell him how to vote.